Fresh scents of green apple, grapefruit and cardamom are the prelude of the exciting fragrance and represent the courage and the strong character of the iconic Super Hero. The virtuous heart note is made up of ozone, citrus and a spicy note. Cedar, amber and sandalwood create an intensive finish which completes the composition. “Superman - Man of Steel” is a powerful and irresistible fragrance for the heroic man who shows his strength and courage in every situation. The design of the dark blue flacon is based on the unique suit seen in Man of Steel the feature film, and features an elaborating haptic. The unique Superman S-Shield highlights the cap, which represents the Man of Steel, in a noble steel look to decorate the flacon. 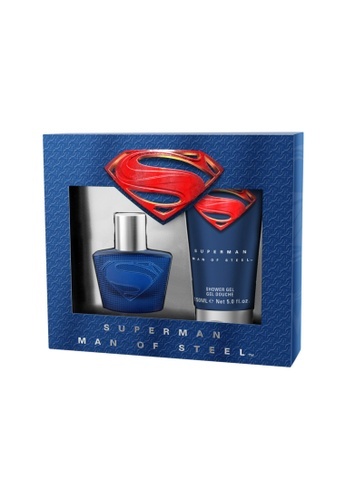 A “Superman - Man of Steel” gift set now available, consisting of a 30 ml EDT and a free shower gel. Can't find Superman Man of Steel EDT 30ml + Shower Gel [YS412] in your size?